End of the "cul de sac"--the slideGot your attention, didn't I? Now I hope you won't be disappointed if this blog is only about Highway 1 north of Cambria. For those of you who have never driven Highway 1 between Carmel and Cambria, it's famous for its instability. All it takes is a good rainy season to bring sections of cliff onto the highway, or sections of highway into the sea. This year saw both. 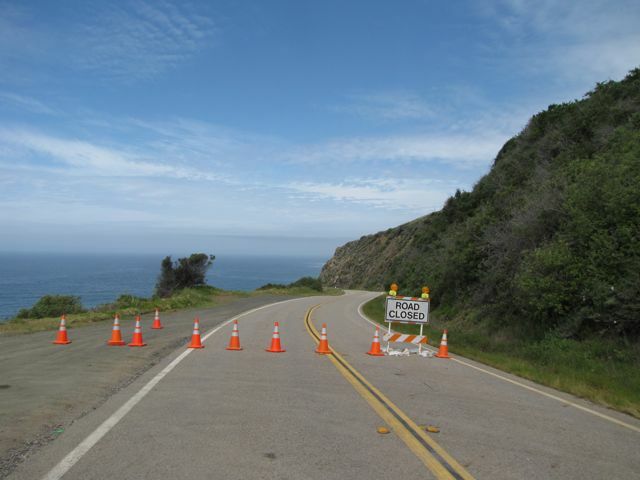 First about 60 feet of southbound lane slipped into the ocean just south of Carmel, closing the highway to through traffic for a month, and creating one very long cul de sac. Then a slide of mud and rocks at Alder Creek, just south of Gorda, turned Big Sur from a cul de sac to an island for days. One lane is finally open at the northern end, but now "82,500 tons of damp dirt and rocks" are sitting on the road again near Alder Creek, and may not be cleared for a month. Ella and I have been feeling like shut-ins since the dislocation and subsequent relocation of one of my toes. (She's got it good--friends come get her and walk her intermittently, while I'm stuck in my chair.) Today we needed to get out. (And I can wear a shoe! Talk about gratitude for the small things in life.) So we took a drive to see what 82,500 tons of dirt and rock looks like. I'm not sure the photos are illuminating on that score, but we had a great drive. 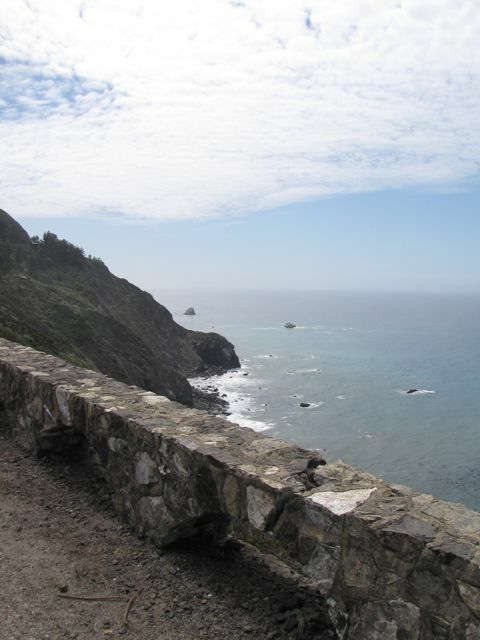 I've never gone up the Big Sur Coast without my love of the natural world being reawakened. I once wrote, in an op-ed, "Remember the Native American wisdom, 'We didn’t inherit It looks like this, but try to imagine a road under it the Earth from our ancestors, we’re borrowing it from our children?' I must be quite the radical, because I think it doesn’t go nearly far enough. We don’t own the Earth at all, in my opinion. It owns us. Argue with me all you want, but remember to duck when the Earth decides to prove my point." I thought of that again, looking at the slide. Cal Trans does a great job of keeping this epic road passable year after year, but it's an uphill battle. When all is said and done, nature is stronger. If it wants its way, it will get its way. Of course we stopped at the Salmon Creek waterfall, which is in great shape from all the rain. A short video follows. The funny sound in the first clip is Ella, asking, "Please can we go already?" She doesn't follow the logic of photos and videography. She just wants to hit the trail. Especially when her person has been weirdly inactive for three weeks. As an afterthought, the painter of the clouds was in rare form. It's a good day. Most of them are, I find, if I use them well, and if I let them be.